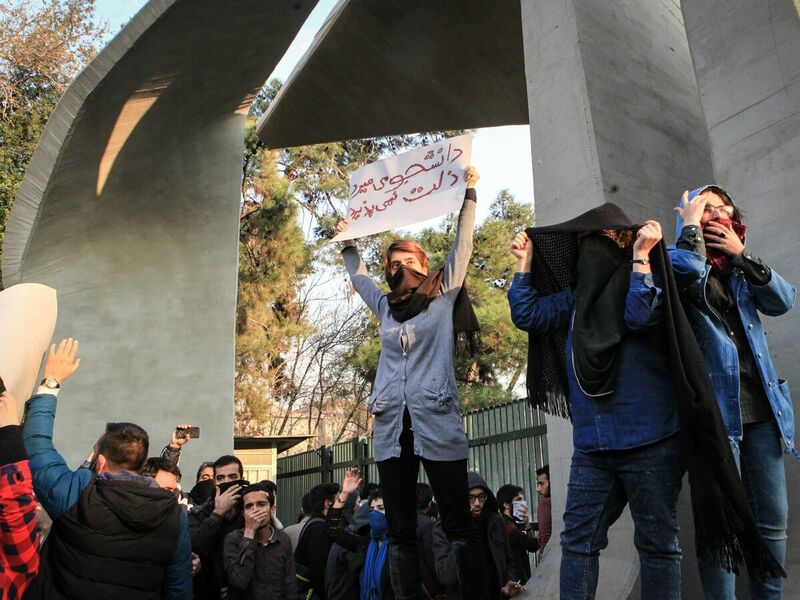 Don't Oversimplify The Protests In Iran : Parallels Only those blind to realities on the ground in Iran are now blindsided by the wrath of the Iranian people, writes Abbas Milani. Iranian students protest at the University of Tehran during a demonstration driven by anger over economic problems on Dec. 30. For years, Washington's thinking on Iran has fallen into two oversimplified opposing camps. Regime apologists insist the Islamic Republic is strategically invulnerable and the United States must not only accept, but appease, the status quo. On the other side are American jingoists who rightly point to the Iranian regime's egregious behavior — human rights abuses at home and proxy bating of the U.S. and its allies regionally — and then wrongly conclude that no negotiation with the regime is warranted and that the only prudent policy is regime change in Iran. Both were wrong in the past, and are even more harmful now when the regime is in the throes of a serious test. The regime is strategically weak because it faces daunting challenges — from oil price changes and water shortages to a disgruntled, Internet-savvy, youthful population, led by increasingly assertive women, hampered by chronic double-digit inflation and unemployment, and angered by corruption, cronyism and the squandering of massive sums in proxy wars, particularly in Syria. American jingoists wrongly conclude that no negotiation with the regime is warranted and that the only prudent policy is regime change in Iran. The gradual grind of the indignities of poverty and despair, despotism and double-talk, has made the political landscape ripe for explosion. Only those blind to realities on the ground are now blindsided by the wrath of the people. The regime and its apologists still point to possible Saudi, Israeli or American roles in fueling the political fires spreading in Iran. Much of the protest ignited in small towns that were known as bastions of faith, places that lack any big-city anonymity and where no one can escape the watchful eye of "Big Brother." Surely foreign meddling might exist, but unless there is something rotten in the state of the economy and politics of a country, no "outside agitator" can wreak the kind of havoc we now see in Iran. Prudent policy and sober thinking on Iran today has to take these discordant realities into account. No less prudent, indeed exigent, is the recognition that the work of democracy for Iran is the responsibility of the Iranian people themselves. A central part of the political discontent is with a system that says one man — Supreme Leader Ali Khamenei, "appointed" by Allah — knows what is best for the country. Surely then, the notion that one country, especially the U.S., with its troubled history with Iran, can or should deliver democracy to Iran is anathema to the Iranians' dignity and democratic aspirations. There has been far too much simplicity in perceiving President Trump's Twitter posts of support for the Iranian people. Views in the United States, and among Iranians everywhere, range from exuberant embrace of every tweet to disgusted dismissal of them all. Critics rightly point to the Trump administration's misguided ban on visitors from mostly Muslim countries, including Iran, Trump's rants against the internationally binding nuclear deal with Iran, his near-total embrace of Saudi Arabia's regional policies (largely aimed at thwarting its rival Iran), the complicit silence on the human tragedy that is Yemen, and, finally, the president's strange decision to call the Persian Gulf the "Arabian Gulf." They submit that these facts disqualify him from offering genuine support to the Iranian people. But Trump, however critics rightly fault his policies, is also the president of the United States. The authority and power of the office allows, indeed demands, that he offer his support for the democratic aspirations of people in Iran — a gesture that should be tempered by humility and caution, not tethered to arrogance or egotistical hubris. If the president emphasizes that Iran's future must be determined by all Iranians — including the women, the youth and all religious and ethnic minorities — with no foreign interference, his tweets will be more poignant. No less is expected from European leaders, who need to be more vocal in opposing violence against Iran's peaceful demonstrators. One concrete way both the U.S. and Europe can help is to use their technological prowess and ensure free and unfettered access to the Internet in Iran. The regime has now declared a virtual digital martial law by slowing or shutting down the Web. One concrete way both the U.S. and Europe can help is to use their technological prowess and ensure free and unfettered access to the Internet in Iran. In Iran, too, a different kind of hubris is sure to force the hands of all factions caught in a dangerous situation. On the one hand, the people want to avoid turning Iran into another war-ravaged Syria. On the other, Iranian reformists have long known that the status quo is untenable yet they choose not to openly defy the supreme leader. They are cautious of the past, and were initially reluctant to support today's protest movement because of such silly claims that it is "rootless." That might well have compromised the reformists' ability to now act as caretakers for the troubled ship of state. Most important of all, Khamenei, whose contrition is more important than anyone else's, seems by temperament unable to accept any errors. His hubris is one of the central problems in the country. He controls billions of dollars of assets, has a disproportionate share of power, is unelected and virtually unimpeachable and he is obsessed with a paranoid rhetoric that sees foreign "enemies" behind every failing of the regime he has led for three decades. His unwillingness to accept responsibility and offer words of contrition might leave the increasingly defiant people of Iran no choice but radical change. Abbas Milani (@milaniabbas) is the director of Iranian Studies, Stanford University and co-director of Iran Democracy Project at the Hoover Institution.